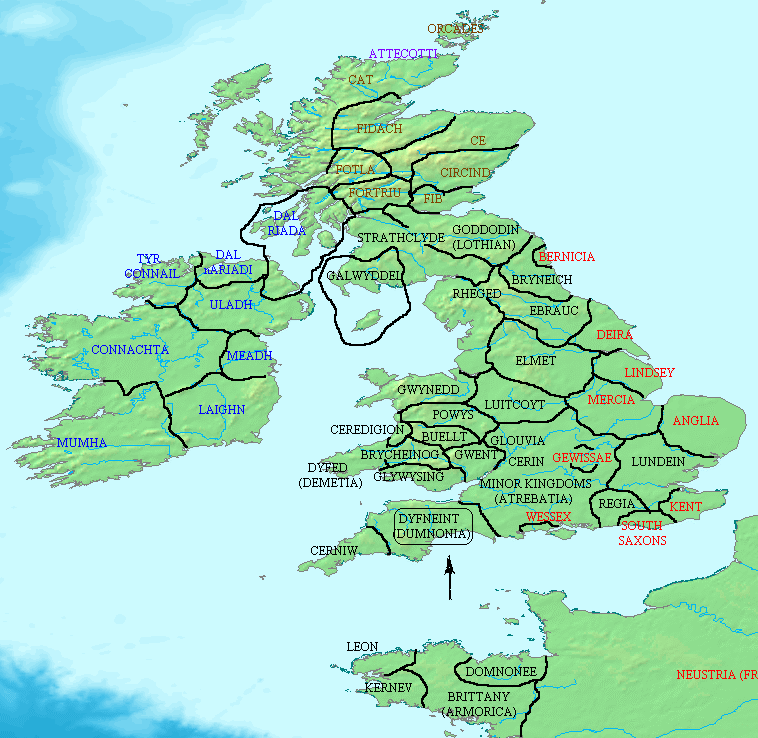 Britain in the 6th century (suggested or approximate boundariess). The Anglo-Saxon principalities or tribes are noted in red, the Briton principalities in black, the Irish in blue and the Pictish in brown. The Attecotti of the northern edge being ethnologically indecipherable, are noted in their own colour. In the 7th cent., the Angles of Bernicia, Deira and Lindsey were united in the large kingdom of Northumbria. Bernicia, Deira and then Nortumbria destroyed and conquered the Briton kdms of Bryneich, Ebrauc, Elmet and South Rheged. Mercia conquered South Elmet and a part of Luitcoyt. The territory of Lundein (London) was annexed mainly by Essex (East Saxons) and East Anglia, and Regia by Sussex (South Saxons). Finally Wessex joined by the Gewissae (possibly descendants of Germanic soldiers of Rome), managed to destroy and annex the Briton kdms of Glouvia, Cerin and Atrebatia, pressing hard towards Dumnonia (possibly Arthur’s homeland). A part of the Dumnonii had already fled to Armorica founding the colony of Domnonee. It seems that the principality of Kerrnev in Armorica was also a Briton colony originated from Cerniw of Cornwall. The name of Leon in Armorica probably originates from a Celtic verbal corruption of the Latin ‘Legion’ but it cannot be defined if this principality had Briton origins. The Scots (Irish) of Dal Riada had already colonized modern Argyll pressing the Pictish principalities (map and caption added by P. Deligiannis ). British history contains several periods of major cultural change. It remains controversial as to how much these periods coincided with substantial immigration from continental Europe, even for those that occurred most recently. In this study, we examine genetic data for evidence of male immigration at particular times into Central England and North Wales. To do this, we used 12 biallelic polymorphisms and six microsatellite markers to define high-resolution Y chromosome haplotypes in a sample of 313 males from seven towns located along an east-west transect from East Anglia to North Wales. The Central English towns were genetically very similar, whereas the two North Welsh towns differed significantly both from each other and from the Central English towns. When we compared our data with an additional 177 samples collected in Friesland and Norway, we found that the Central English and Frisian samples were statistically indistinguishable. Using novel population genetic models that incorporate both mass migration and continuous gene flow, we conclude that these striking patterns are best explained by a substantial migration of Anglo-Saxon Y chromosomes into Central England (contributing 50%–100% to the gene pool at that time) but not into North Wales. Following depopulation during the last glacial maximum and subsequent resettlement by hunter-gatherers ca. 7000 b.c., the history of Britain has been marked by a series of cultural transitions. These include the appearance of sedentary agricultural communities (the Neolithic transition) (ca. 4000 b.c. ), the arrival and spread of Late Bronze-Iron Age and Celtic material culture (ca. 1000–100 b.c. ), Roman occupation and influence (a.d. 43–410), the rise of Anglo-Saxon language and culture (ca. a.d. 400–800), Viking invasions and influence (ca. . 800–1000), and the Norman Conquest (a.d. 1066) (Kearney 1989<$REFLINK> ; Hunter and Ralson 1998<$REFLINK> ; Davies 1999<$REFLINK> ). The use of migration as an explanation for cultural transitions has varied greatly over the past 100 years and remains controversial (Clark 1966<$REFLINK> ; Chapman 1997<$REFLINK> ; Burmeister 2000<$REFLINK> ; Shennan 2000<$REFLINK> ). Before the 1960s, archaeological evidence for cultural change (such as changes in pottery type) was often interpreted as prima facie evidence for substantial immigration. The processual school or New Archaeology that emerged in the 1960s and 1970s rejected this view, arguing firstly that the adoption of new cultures could occur through trade or by the influx of a small ruling elite with minimal or no impact on the gene pool (the “elite dominance” model of Renfrew [1987<$REFLINK>] ) and secondly that if no positive evidence for migration could be found then explanations based on non–migrational internal forces were more parsimonious and therefore preferable (Adams 1968<$REFLINK> ; Adams, Van Gerven, and Levy 1978<$REFLINK> ). More recently, this antimigrationist stance has been questioned (Anthony 1990<$REFLINK> ; Härke 1998<$REFLINK> ) and migrational models reconsidered (e.g., Chapman and Hamerow 1997<$REFLINK> ; Burmeister 2000<$REFLINK> ). These changes in archaeological opinion have had a particular impact on interpretations of cultural transitions in Britain (Clark 1966<$REFLINK> ). Because of its geographical location on the northwestern edge of Europe, migrations and invasions from the continental mainland were once considered to be the obvious explanation for cultural transition (e.g., Hawkes and Hawkes 1942<$REFLINK> ). Today, cultural changes before the Roman invasion, which are for the most part lacking in historical records, are no longer interpreted as automatically implying migration, and for these changes the role of migration remains unresolved. For cultural transitions after the Roman invasion, historical records argue against large migrations coinciding with either Roman occupation or the Norman Conquest, and the prevailing view is therefore that these later events represent examples of elite dominance (Kearney 1989<$REFLINK> ; Davies 1999<$REFLINK> ). Historical and archaeological research argue for some degree of Viking settlement in both East Anglia and the Midlands in the 9th century a.d. but against a substantial displacement of the existing people during this period (Richards 2000)<$REFLINK> . Today, the most hotly debated of all the British cultural transitions is the role of migration in the relatively sudden and drastic change from Romano-Britain to Anglo-Saxon Britain (Hamerow 1997<$REFLINK> ; Burmeister 2000<$REFLINK> ). This transition was once widely accepted as providing clear evidence for a mass migration from continental Europe and the near-complete replacement of the indigenous population in England (Leeds 1954<$REFLINK> ; Myres 1986<$REFLINK> ). Stories of migration are included in the writings of Gildas (ca. a.d. 540) and Bede (a.d. 731) and hinted at in Anglo-Saxon sagas, such as Beowulf (Davies 1999<$REFLINK> ). Archaeological evidence confirmed a rapid rise of continental culture in England (Esmonde-Cleary 1993<$REFLINK> ) and suggested a contemporaneous desertion of continental Germanic settlements. More recently, however, authors have questioned the evidence for large-scale immigration (Crawford 1997<$REFLINK> ; Hamerow 1997<$REFLINK> ) and continental emigration (Näsman 1988<$REFLINK> ; Petersen 1991<$REFLINK> ) and emphasized the continuity of the Romano-British population in England. The sudden change to an Anglo-Saxon culture has been attributed instead to rapid acculturation and indigenous developments, with only a small number of Germanic immigrants (perhaps a male military elite) settling in Britain (Arnold 1984<$REFLINK> ; Hodges 1989<$REFLINK> ; Higham 1992<$REFLINK> ). The contribution of Anglo-Saxon immigration to the modern English gene pool thus remains uncertain. That is absolutly not the fall, most of english people have germanic roots. A important “celtic” part have roots in belgians and the picten (and her stones) have vendel roots of Jutland. A little part of Irland came from iberia. Most of Celts is a roman import. First celts in England not earlier as 200 BC. Tell me, what is the real language of England/Irland when they have no celts? and ps: Druids is a variation of True and this is germanic!